9526 Palpatine's Arrest is a Star Wars Episode III: Revenge of the Sith released in 2012. It contains 649 pieces. 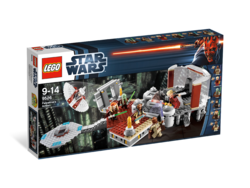 The set consists of a small speeder, Palpatine's office, and six minifigures. 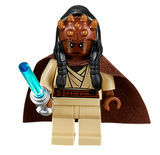 The minifigures included are Palpatine, Anakin Skywalker, Mace Windu, Kit Fisto and Saesee Tiin in new variants, plus Agen Kolar who has never been released before, meaning all minifigures in this set are exclusive. The set includes a landing pad, which is primarily grey, with transparent blue landing lights on each side of it. A small hole, meant to fit vehicles into, is set into the landing pad's centre. A walkway, made of dark grey plates with light grey tiles set on them, leads up to Chancellor Palpatine's office. The office's carpeted floor is made up of three sections, with the walkway connecting to the centremost section. The entrance to the office is set on the left section. It features sliding doors that can fit a minifigure through one at a time. The entrance is an arch, made primarily of dark grey with light grey accents, with some gold elements set into it. The right section of the office has a gold statue (an unprinted LEGO Games Microfigure) on a plinth set on it, and no other decoration. The interior of the office is dark grey. In it are several seats, and Palpatine's desk and chair. A large bay window is located on the far side of the office. There appears to be a lever underneath the office's floor, indicating a possible play function. This set represents the scene in Star Wars Episode III: Revenge of the Sith. Shortly after Palpatine reveals to Anakin that he is a Sith, Anakin leaves to find Mace Windu to tell him that Palpatine is Darth Sidious. Windu instructs Anakin to stay behind so he can deal with Palpatine himself, and says he will grant Anakin Master Jedi status should such information be correct. Mace Windu, along with Kit Fisto, Saesee Tiin and Agen Kolar head to Palpatine's office to confirm Anakin's information. They draw their lightsabers and declare that Palpatine is under arrest for suspicion of being a Sith Lord. Palpatine draws his red lightsaber and lunges forward, screaming. 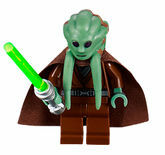 He quickly cuts down three of the Jedi but appears to have met his match with Mace Windu, whom he fiercely duels with. Windu backs Palpatine into a corner next to the window, and Palpatine fires Force lightning at Windu to defend himself. This release of energy greatly disfigures him, after Windu blocks and reflects it with his lightsaber, leaving Palpatine seemed to be exhausted and defeated. Anakin bursts into the room and is torn between his loyalty to the Jedi and his friendship with Palpatine, who can teach him how to save Padmé's life. Palpatine uses the situation to tell Anakin that the Jedi were going to betray the Republic, but Windu declares to Anakin that Palpatine is the traitor. As Windu is about to make the killing blow, Anakin rushes in and cuts off his right hand. Palpatine seizes the opportunity to blow Windu out of the window with Force lightning, sending him into the urban city of Coruscant, falling to his death, which marks Anakin's journey to the Dark Side complete. Palpatine then dubs Anakin the name of Darth Vader and makes him his apprentice. This is a description taken from LEGO.com. Please do not modify it. (visit this item's product page) Arrest Senator Palpatine at his Coruscant apartment suite! On Coruscant, the Jedi Council has sent 4 of its most trusted Jedi Masters to arrest Senator Palpatine at his apartment suite. 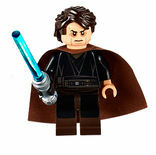 As the evil Sith Lord struggles to fend off the Jedi, will his newest recruit, Anakin Skywalker, come to his rescue? This fantastic recreation of the scene from Star Wars: Episode III Revenge of the Sith features detachable entrance with sliding doors, hidden Lightsaber, Sith lightning bolts, Mace Windu window catapult, Force jump lever, and detachable landing pad with Jedi airspeeder with opening cockpit and dual flick missiles. Includes Anakin Skywalker, Mace Windu, Saesee Tiin, Agen Kolar, Chancellor Palpatine and Kit Fisto. Turn Palpatine's head to show his second face! Defeat the evil Sith Lord! Avoid being catapulted out of the window! Details as to what "The Arrest of Palpatine" would have included if it won the competition. In 2008 when Toys 'R' Us asked LEGO fans what set they'd like for 2009, Palpatine's Arrest was one of the three options given to them. The option for "The Arrest of Palpatine" was 2nd place with first place for 7754 Home One Mon Calamari Star Cruiser. This set is the first Star Wars set to have a gold lightsaber hilt. It was released in 2013 in Italy. Facts about "9526 Palpatine's Arrest"
Arrest Senator Palpatine at his Coruscant apartment suite! This page was last edited on 12 January 2016, at 22:04.